Taoufiq Izeddiou, an internationally renowned choreographer and dancer, has recently conducted in Bologna the first of the two workshops preparing the collective performance, '100 pas presque', that will be presented during 'Right to the City', the international festival of Atlas of Transitions. 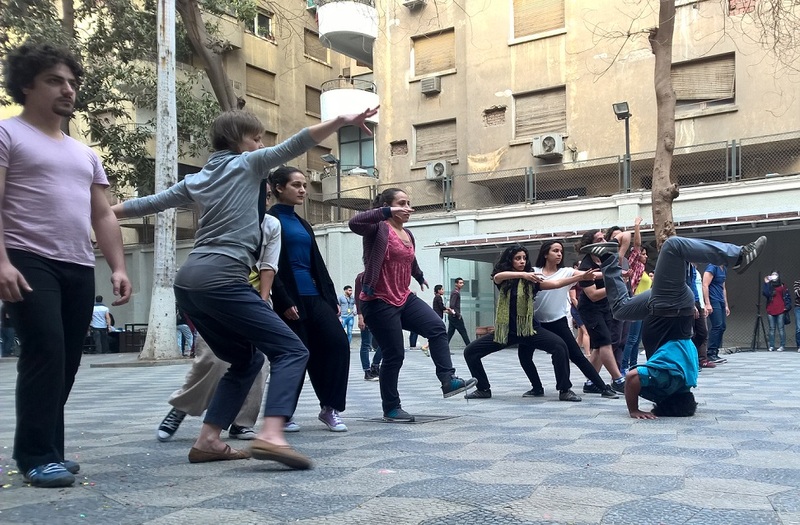 In this interview, recorded on 9th April 2018 and available on Atlas of Transitions' YouTube page, Taoufiq talks about contemporary dance and why we should walk all together. Q: What does ‘100 pas presque’ mean? A: If I think about all the work we do across different venues and locations, I realise that ‘100 pas presque’ is something new every time, since, every time, it acquires new meanings. When I see the people walking together, I have the feeling that I am looking at a ‘walking world’, with all its issues, that people from different regions and contexts constantly face. The only answer I can give to this question is that we should walk together – towards the same direction, by listening to each other, and by sharing the same message. We should find a common language. This is something missing within society nowadays, or slowly disappearing, if you like, and it calls us personally, as a sort of social emergency. I invite everyone to participate in our walk, to listen to the others, the walk itself, to make steps together by slowing the time down… All this should occur so that we can reflect, find the same rhythm, words… It sounds utopic and idealist, I know, but why not to dream a little! 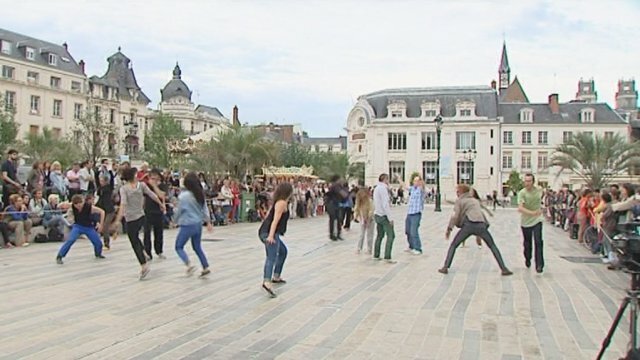 Q: How do you apply the ‘100 pas presque’ performance across various cities, which are distinct from each other? Q: You are used to work with people who have very different backgrounds and abilities. How do you create that single body, that spinal column you mention? A: For a start, let’s consider what ‘walking’ means. A walk can seem something ordinary: we wake up, walk, sit, lie-down… Walking is the very first thing we learn to do. I would like to work on the movements that a child makes throughout his growth… Starting from this idea of ‘walking’, you can then think about the concept of ‘falling’. Walking means to fall. Falling means to learn how to walk – this is the precious rule I always follow. When we slow down, we interrupt the space flow around us as well. Then, if we all look for something inside of us, like an inner memory, a sort of harmony settles between the people involved, who identify themselves with a common principle. All choose the same direction, a future, a present, a past… ‘100 pas presque’ is like to write a one-hour music score in gradual crescendo, which gives a frame to the entire group’s work – nobody is left alone. All the participants work on their own, looking for the movements that trigger their body. Q: As a choreographer, you create both collective performances and individual works, with your own body on stage. Is dance practice, as an expressive language, always the same? In other words, what is dance? A: Of course, yes. There is a contrast between the dance practice I use in my solo performances and the one that can be developed through collective works. This reflects a sort of personal duality, which is connected to my own story. I need time alone, where I dance alone and, at the same time, I feel the urge to amplify what I explore by sharing it with others, by dreaming about it collectively, by orchestrating and choreographing others’ bodies… I may say that my own body prepares me to a greater staging, and that a collective work prepares me for a solo performance. Q: Coming back to ‘100 pas presque’… How did you conduct your workshops in different cities? What did you get from those experiences? 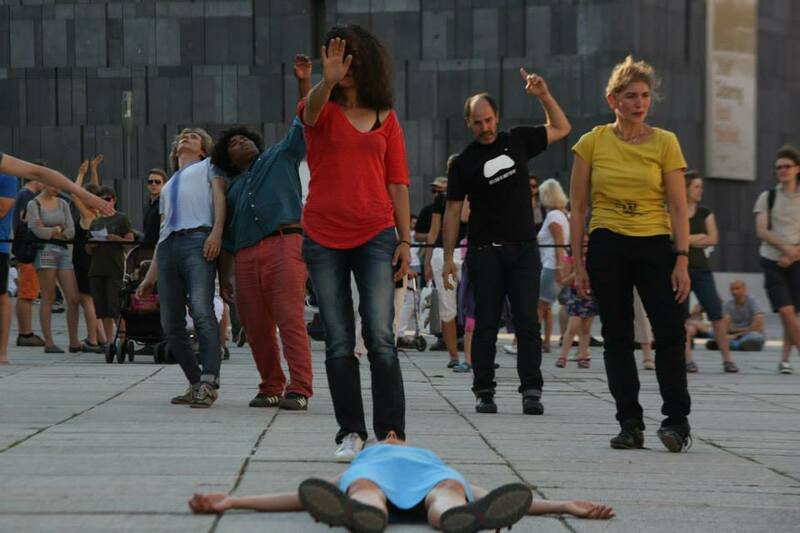 A: The first time we performed the collective walk ‘100 pas presque’ was a kind of excuse to confirm that contemporary dance truly exists in Morocco. We aimed to give visibility to the dancers by stopping the heart of the city (Marrakesh) for about an hour while crossing a roundabout. That was a radical idea. It was like saying at loud, ‘Hey, look at us, we’re here! Let’s talk, let’s do something together’. That very first time, ‘100 pas presque’ was not conceived as a project to be exported, and neither as an artistic idea. 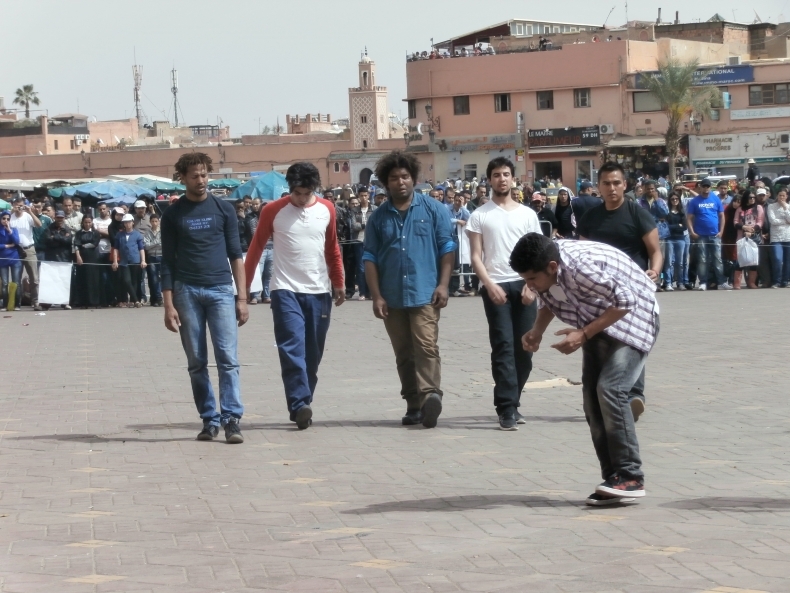 It was a form of rebellion, a sort of creative proof in public space testifying that the dance scene is alive in Morocco as well, and that there are numerous talented dancers. In 2013, I received the first proposal to bring the project abroad, to Marseille, in France. We accepted and for three days we worked with Kurdish musicians and professional dancers at the Old Port of Marseille. It was incredible. From that magic moment on, ‘100 pas presque’ has become a universal idea that anyone can appropriate. Q: Usually, what is the public’s reaction to the performance? A: Since the walk lasts an entire hour, the audience progressively accumulates energy during the first forty-five minutes - that’s the time we need to go through the public space… We put the audience on hold, by making them feel the increasing energy, step by step. Then, a real body explosion takes places – and this is not the kind of explosion we hear nowadays in the news. It is a dance explosion, which comes from bodies’ movements, from the souls and inner power of the dancers. During these forty-five minutes we invite the public to join us, so people are actually ready since the beginning. They are aware that they are about to experience something together with us. Suddenly, all become dancers, musicians, singers. Dance is inside us, in our bodies, in all our life experiences. We cannot hide it. Dance and music belong to each of us. Every time we did the performance, the public has been enchanted by our invitation to dance, all together, swung by the sensation of freedom… I may say that this has turned into our credentials. Q: During a performance, did it ever happen to you that someone developed an unpredictable behaviour and changed what had been prepared earlier? Q: Do you have specific expectations for the collective walk that will be performed in Bologna during ‘Right to the City’, the first international festival of Atlas of Transitions? Q: About ‘On Marche’, the festival you direct in Marrakesh… What is its mission? A: Initially, I didn’t have in mind that I was about to put a festival together… ‘On Marche’ represented more an occasion to develop a debate with the artists and choreographers working in Morocco and stay a week or so together while discussing each one’s ways of staging, also to test the public’s reactions to our artistic productions. It was the year 2005! We got a feeling about the current situation in the country and, after a week of intense work, we tried to understand how to make the public’s new interest in performing arts last. 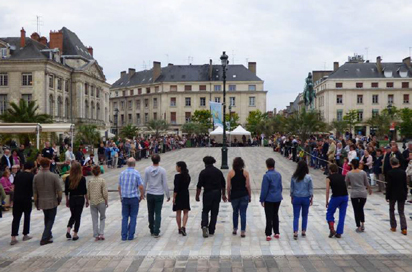 'On Marche' has been a great success thanks to the active participation of the artists, the organisers, Saïd and I, Meriem, all of us who have contributed to the festival organisation. At some point we asked ourselves about how to make the event unique, different from all the rest. We had in mind a festival that listened to its audience and territory. Q: What about the ‘Botero en Orient’ project?